Synopsis: You decide when the race is over! Lets face it, the side markers on the Gen 2 Cooper S are just plain gross. It looks like MINI had a design intern that was fresh from the Toy Industry doing the design of those pups. 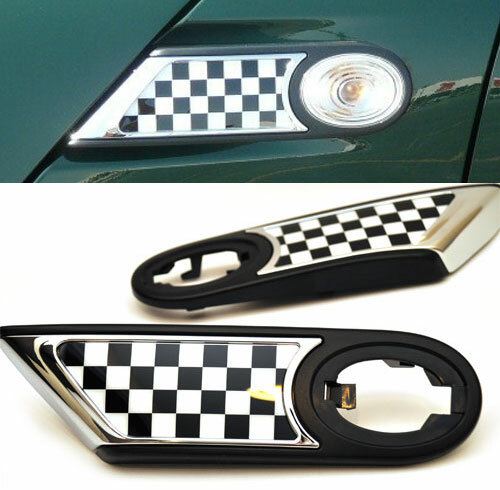 These replacement Checkered Flag Side Marker Housings for Gen 2 MINI Coopers are a winning option to add some design detail to your MINI. Priced as a pair, theycompletely replace the existing side marker housings that are supplied from the factory. You will need to transfer the oval light which clicks in from the back. To remove existing housings, simply slide the housing forward (towards the gap between the fender and hood) and the whole thing pops out. Please note, these are NOT the OEM supplied side markers and the inserts are not interchangeable with the OEM units. However, they are engineered and manufactured to very high standards, and the cost is lot lower. We think it is a better overall product and the lower price makes it an easy decision. If you would like to get the OEM side markers (inserts and housings), let us know and we can get those as well.